This post has been a while in the making. Back in April Tate & Lyle sent me a limited edition box of royal icing sugar The intention was to use the sugar for a Royal Wedding bake, but of course the sugar wasn’t suitable for the Mr Whippy Cakes I made so it’s been sitting in the cupboard waiting for when I had some free baking time. The one thing you can guarantee for the late spring bank holiday is that it won’t just rain it’ll pour which meant I had a whole day free to bake until my heart was content. So with Paloma Faith & Noisettes cranked up on the stereo, pinny on, I headed to the kitchen. Anyone who celebrated their childhood birthdays in the 80s will remember parties with glee. No fancy parties for us. We were happy with pass the parcel, what’s the time Mr Wolf? and a table laid with the finest of E-number crammed treats. Bring on the cheese & pineapple on sticks pushed into a jacket potato in foil to look like a hedgehog, day-glo Wotsits, Fondant Fancies and most importantly the bright Party Rings. It’s no lie that Hubs is addicted to Party Rings and he can quite easily get through a packet of them in one sitting so for my first foray into biscuit decorating I knew I had to try these party classics. I had been recommended The Pink Whisk’s Sugar Cookie recipe as being perfect for this type of biscuit. Yes this recipe does make a huge amount of dough but it can be frozen as a ball or sheet of dough or even as unbaked biscuits. Just open freeze the cut out shapes, place in a ziploc bag and bake as a when you need them. I have cut some biscuits ready to make Jammy Dodgers in the near future. The icing on party rings is flavoured but the packing gives little away as to what flavour it is so I went for raspberry after picking a small bottle of raspberry flavouring from Asda. To be honest doesn’t taste anything like raspberry, has more of a fake bubblegum taste but does give the icing a very similar taste to the icing used on party rings. Given this is the first time I’ve decorated biscuits with royal icing it was a learning experience. I had originally piped the contrasting lines on the biscuits that were going to be feathered but this didn’t work as the lines dried before the other icing was pooled on top giving an odd look when the cocktail stick was drawn through the icing. I could also do with getting some more writing icing nozzles. I only have one so instead of using piping bags and tips to pipe the outlines I just used three small sandwich bags with the corners very slightly cut off. This method does work, but would be neater if tips were used. My rustic versions of Party Rings passed the Hubs test and true to form they fit on the fingers just like the originals do. 1) Cream together the butter and sugar until light and fluffy then mix in the egg and vanilla. Sift in the flour and mix until you have a well mixed dough. 2) Split the dough in half and place one half between two sheets of baking parchment. Roll out until dough is around 4mm thick. Repeat with the other ball of dough, then chill the dough for 30 minutes. 3) Using a 6cm diameter cutter cut out rounds then using a 1.5cm cutter cut out a hole in the middle. Place the rings on a baking sheet lined with baking parchment. Place back in the fridge for another 30 minutes. If you wanted to freeze some of the dough, open freeze it at this stage then once they are frozen place in a ziploc bag and cook at a later date. 4) Preheat the oven to 160°c (fan)/180°c then cook the biscuits straight from the fridge for 12-15 minutes until beginning to turn golden brown. 5) Once the biscuits have baked transfer to wire rack and leave to cool completely before icing. You could bake them in advance as long as you keep the cooled biscuits in a Tupperware box to stop them going soggy. 6) Split the icing sugar equally between 3 bowls. Gradually add the water until you have a pipeable icing paste. You don’t want it too thin at the moment or it’ll dribble off the biscuits. Colour the 3 bowls of icing with food dye and stir in a splash of raspberry flavouring. 7) Put the icing into piping bags and pipe an outer and inner ring on the biscuits. This will contain the puddled icing later. Allow the lines to dry for a few minutes. 8 ) Put the icing back into the bowls and thin with some water until the icing puddles. It should act like self leveling concrete. Using a teaspoon put some of the icing on the biscuits and guide the icing into place with a cocktail stick. Using another cocktail stick and some contrasting icing dribble lines of colour on top of the base icing and then drag a cocktail stick through the lines to give the feathered effect. Allow to dry. Store in a Tupperware container. With a hectic and stressful week in work I wanted to do some stress relieving baking and a recipe I found on a forum I lurk on, ticked all the right boxes. The recipe is based on Smitten Kitchen’s slice & bake cookie palette. I’ve never made a biscuit like this before, but I think I now may be hooked. It is such an easy technique and it was nice coming home from work with some fresh dough in the fridge knowing I was less than 15 min away from freshly baked biscuits. These are also the first biscuits (I think) that I’ve made in my KitchenAid. I did a half batch as quite frankly my hips are turning more Nigellaesque by the day. While looking through my baking cupboard for biscuit fillings I found some glace cherries that really needed to be used. Along with my almond extract the idea hit me. 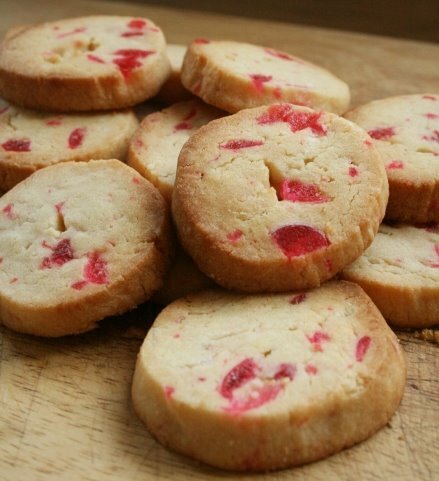 Biscuits inspired by my favourite cake, a Bakewell tart and so it was born – Cherry Bakewell Biscuits. 1) Beat together butter and sugar until you have a buttercream, then beat in yolk and extract. 2) Add cherries and flour then beat again until ingredients are well combined. Flatted dough into a disk, cover in clingfilm and chill for 30 min. 3) Remove the dough from the fridge and roll out into a long log with a diameter of around 3cm. Wrap back up in the cling film and chill for a further 2 hours (minimum). If the dough isn’t chilled sufficiently it will begin to misshape when it is sliced ready for baking. 4) Preheat oven to 180oc. Cut the dough log into rounds about 1cm thick and place on a lined baking tray. Bake for 12-14 min until they are cooked. Once cooked transfer to a wire rack to cool. Sunday was Burns Night and it is on this night that Scots celebrate the poet Robert Burns. The original intention was to make Cranachan, but instead swapped the traditional oats for another Scottish staple, shortbread. Okay I don’t have a Scottish bone in my body. I’m half English and half Welsh so this was really an excuse to eat raspberries out of season. Not something I do very often as no raspberries beat the ones from the PYO farm a few miles down the road. To go with the raspberries and shortbread I whipped together some cream, whisky & honey. The shortbread came from a vintage cookbook Hubs & I were given for Christmas. I love looking at vintage cookbooks and seeing how food trends have changed or not changed in some instances. Amongst my cookbook collection I also own a 1920’s book by Good Housekeeping that instructs me how to be a lady of leisure, my role as a wife and how to organise my servants. Some of the advice in it certainly makes me chortle! Now I usually post my recipes in grams, but in true 1950’s style, and exactly how it is written in my cookbook I’m going to write it in ounces. Incidentally if your ever looking for the best place to do cookery conversions online, consult Delia. 1) Preheat oven to 140oc. Mix flour and salt together then rub in butter followed by sugar. 2) Knead into a dough. Resist temptation to add liquid. Keep kneading the dough and it will eventually come together. Form into a round cake prick with a fork and place on a lightly greased baking tray. 3) Bake for 1 hour. Allow to cool, dredge with caster sugar then slice.